Hi! 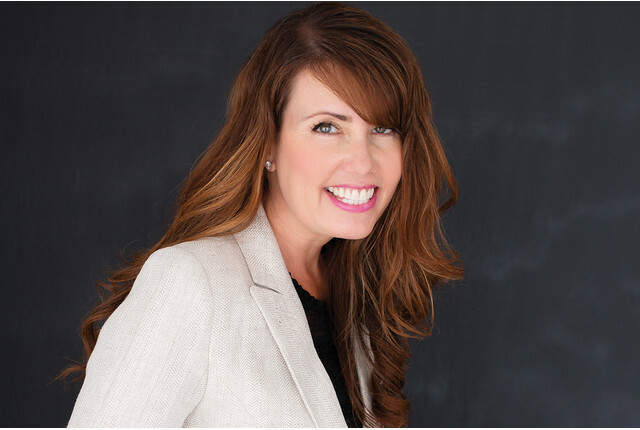 I'm Jen Hadfield - I am a mom of 4, Diet Coke lover and gummy bear aficionado - I also own the DIY daily website Tatertots and Jello. I've been sharing creative ideas on my website for eight years. I have a passion for making our home beautiful but also run efficiently and I am so excited to share some Back to School Ideas with you! As my kids have gotten older it seems that their schedules get busier each year. To stay on top of everything that is going on, I have found that a family command center is a great way to keep organized. 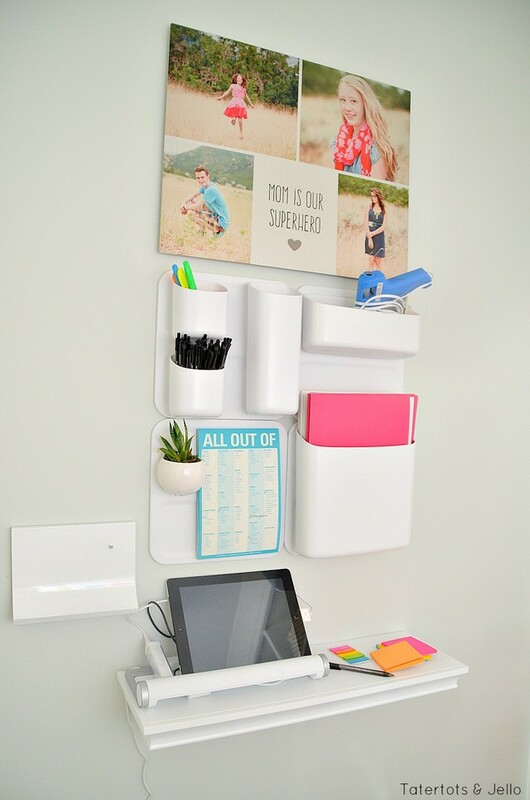 Now is the perfect time to get ready for back to school and create a family command center in your home. I'm sharing five Essential Command Center Elements. Over the years as we have moved, our family command center has changed locations. What you need is a central space in your home. We have had our family command center in the kitchen, the entryway, the living room and now in the mudroom. 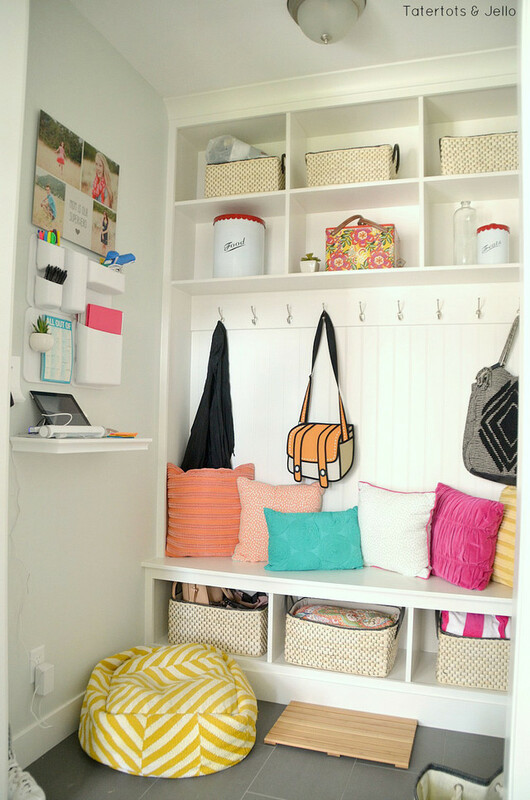 It's helpful if it is a space that everyone passes by as they go in and out of the home. My kids are old enough that most of them have their own cell phones and we do share a family calendar on our phones, but I have found that having a physical calendar that everyone can see really helps us all visualize what is happening each month. You can use any sort of calendar. 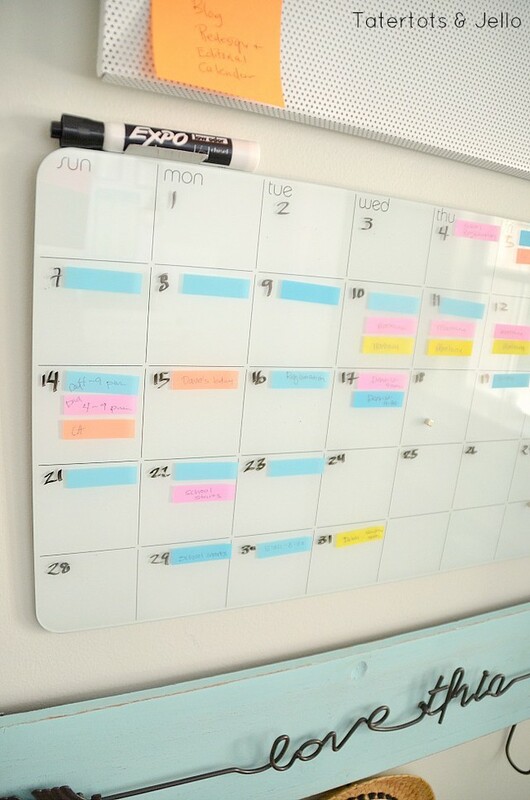 I love this Monthly Glass Magnetic Dry Erase Board. I love the clean look of it, plus there are many ways to use it. 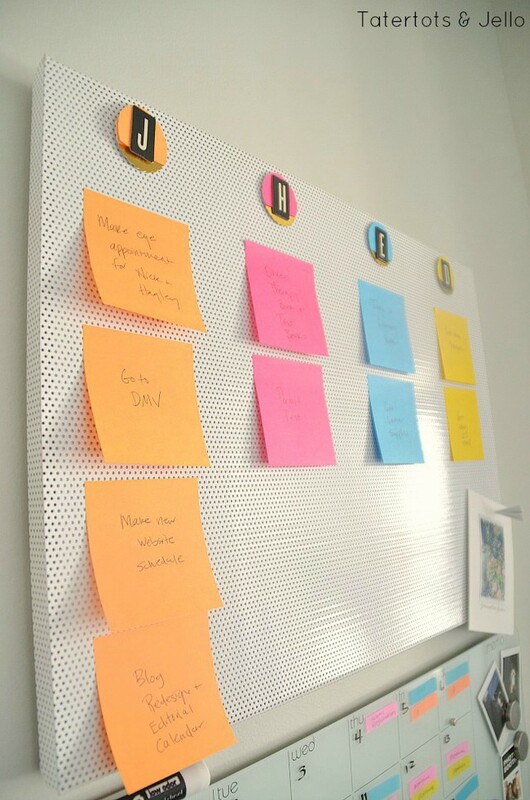 It's a dry erase board but it's also magnetic which is handy for attaching notes or flyers of events. I use a post-it note system on the board to keep track of each person's activities in the family. Each family member gets a different color of post-it note flag and we write the activity and time on the flag. For example, if one of my kids has a dentist appointment, I use their color flag and then write dentist and the time and attach it to the day on the calendar. 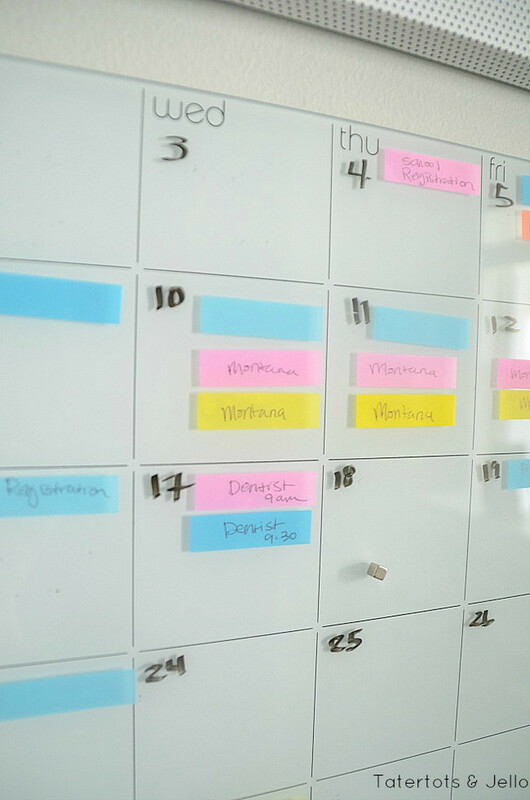 You can also use different colored dry erase markers to do the same thing and write the event on the calendar in that person's color of dry erase marker. I have just found that using post-it notes is cleaner looking and if the date changes it is easy to move the flag. Above the calendar, I have a to-do bulletin board. 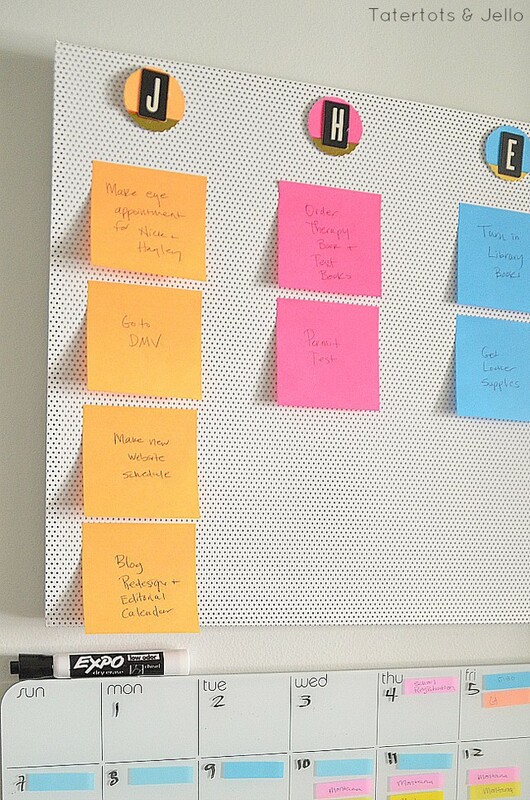 I use the same color system on the to-do board. Each person has a different color. I created an initial tag for each person in the family in their color at the top of the board. Then under each person's initial are the monthly to-do items for that person. We write the to-do item and attach it to the board in that person's column. This is an easy way for each person in the family to see at a glance items they need to get done that month. 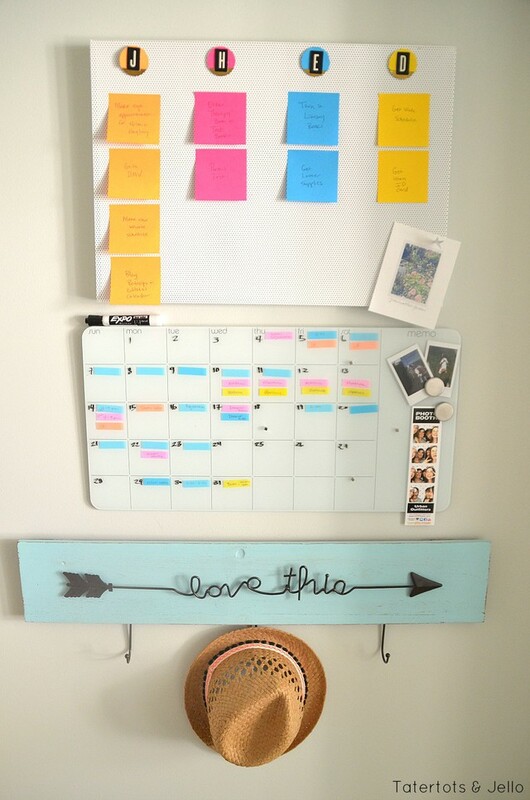 The board is also a great place to put larger items that won't fit on the calendar like wedding announcements and invitations. If you have room, the family command center is a good place to have as a dropping off point for backpacks and outdoor gear. 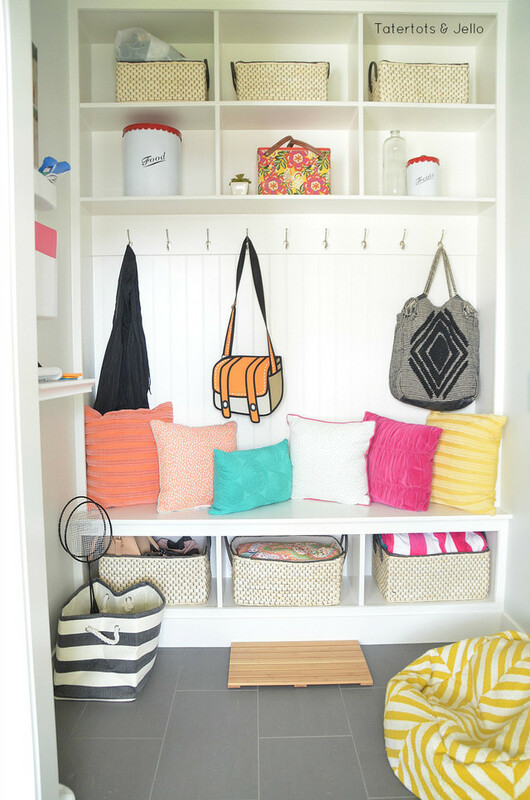 We are lucky to have a mudroom in our new home with hooks and shelves for bins. The bottom bins are a good place to keep mittens and scarves for fall/winter and beach towels and summer things when the weather is warmer. I also have bins above where I can keep other family items that get taken in and out of the house. I use this Loft Bin to keep things like extra shoes and umbrellas for easy access. 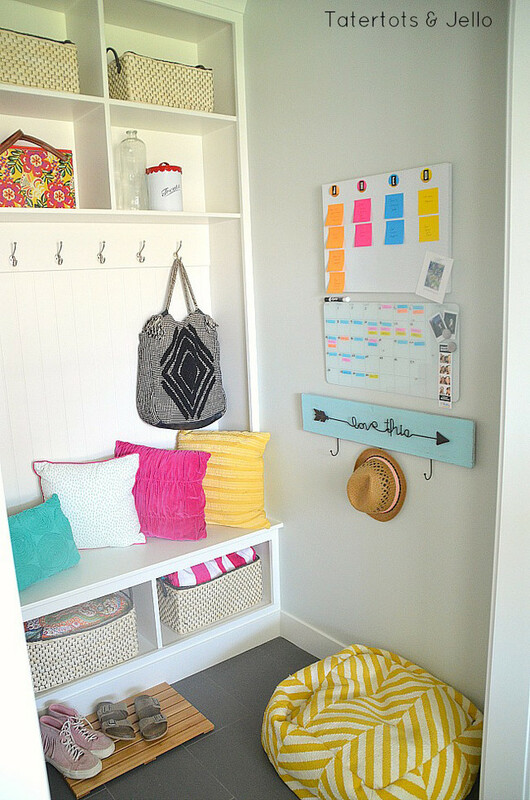 If you don't have a mudroom, you can make your own drop off place with a simple bench, hooks and bins under your bench for outdoor gear. 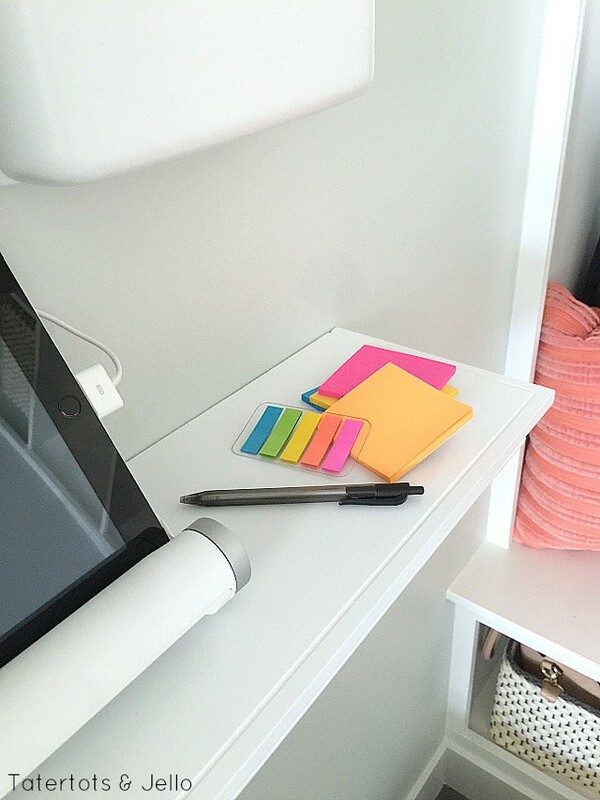 The family command center is also a great place to keep track of important home and school papers. 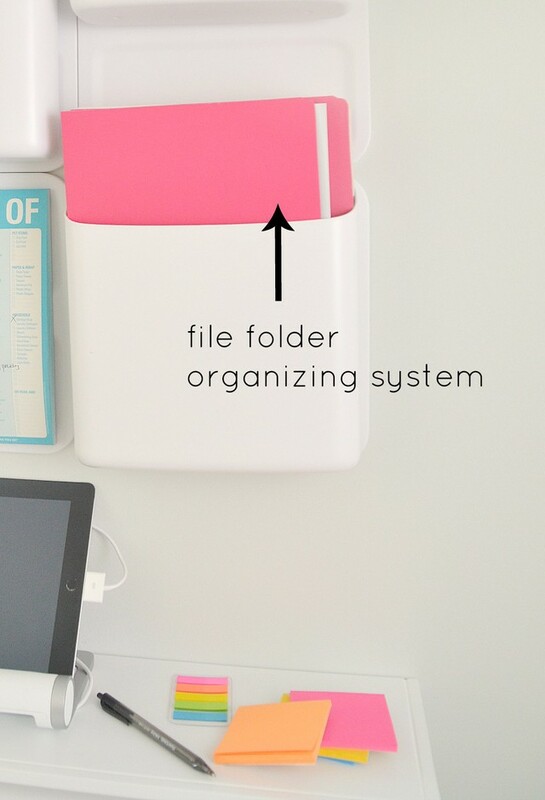 I love the Perch system to for my file folder system. 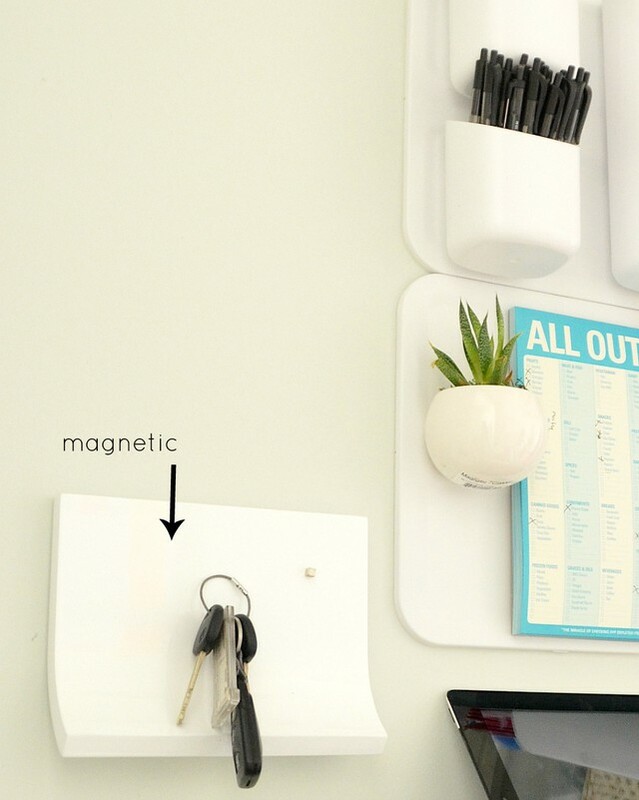 It's also awesome because it's magnetic and so easy to change up. I keep all of our homework supplies in it too like pencils, pens and such. Having four kids, there are so many papers that come home. It's easy to lose papers if you don't have an easy way to keep track of things. What I do is I have a file system. Each person has a file folder in the command center with their name on it. 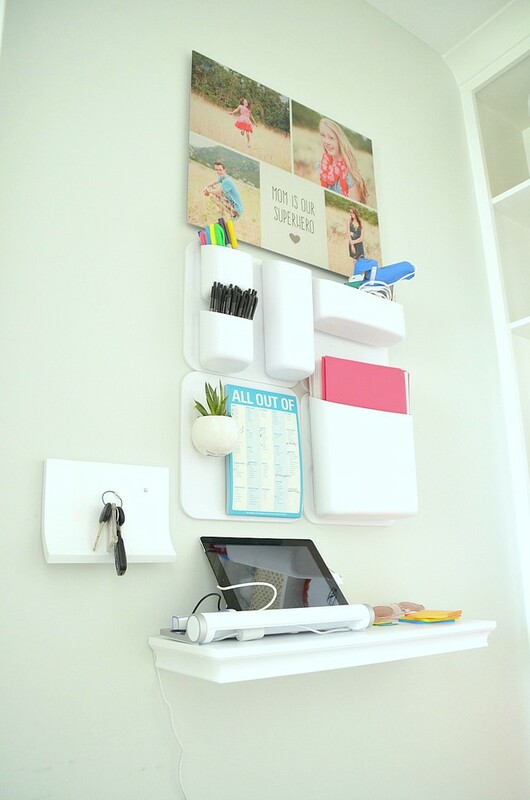 Each day as the kids come home from school, I look in their folders and take out important papers with deadlines and put those papers in their file folder. Those file folders are ones that I check every day to make sure we are on top of school assignments. Once the assignment is done, I can either throw the paper away or I can file it away in an elfa file system I have in my office. I do the same thing with bills. I keep the household bills in a separate file folder and when each bill is paid, I file it away in my office so I still have it on file but it isn't in the current file at the command center. After a few days it gets to be routine to do this and it only takes a few minutes away to keep on top of deadlines. Plus, we don't lose important papers anymore - yay! 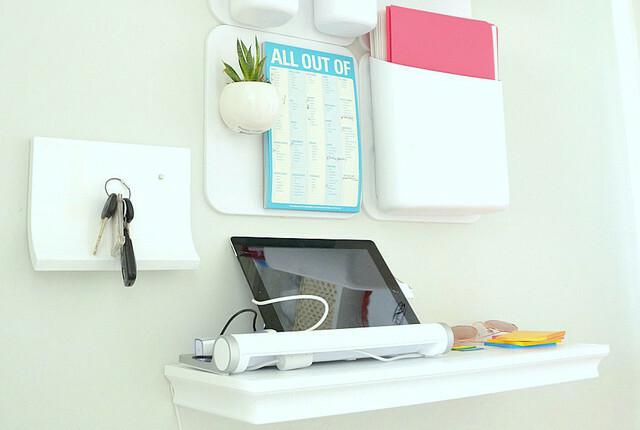 The family command center is a great place to have a family charging station. I use the Quirky Charging Station. It lets us charge multiple devices at once - like our cameras, phones and tablets. I have also discovered that having my kids hand in their phones and devices at a certain time each night makes bedtime so much easier and helps them get better rest. It's also a great place to keep track of keys. I use the Piano Key Holder - I love the clean design and it's magnetic so all you have to do is put your keychain on it and it sticks! We are so excited about our new Back to School Family Command Center. 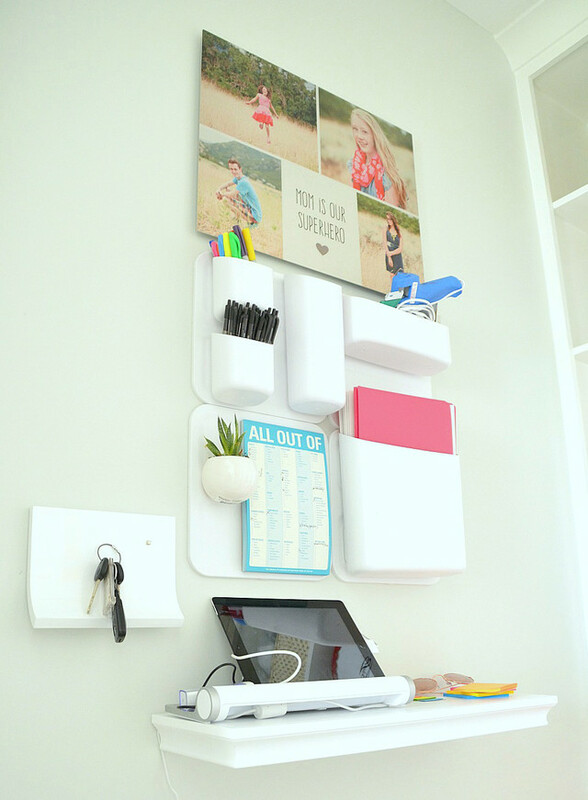 It's going to help us keep everything so organized this fall! Thanks for letting me stop by and share some ideas. And thanks to The Container Store for being so awesome and helping us keep our families more organized!